The difference in size of spherocytes has significance. It is assessed manually, on peripheral smear examination. What's the importance of assessing size difference of spherocytes? Its a story about a guy who uses a "WILSON's" racquet to play tennis. And you all probably know this legend right? Subdural is crescent or semilunar shaped. Epidural is biconvex lens shaped. Say you have a hemodynamically unstable patient with a gunshot wound or blunt trauma to the RUQ. 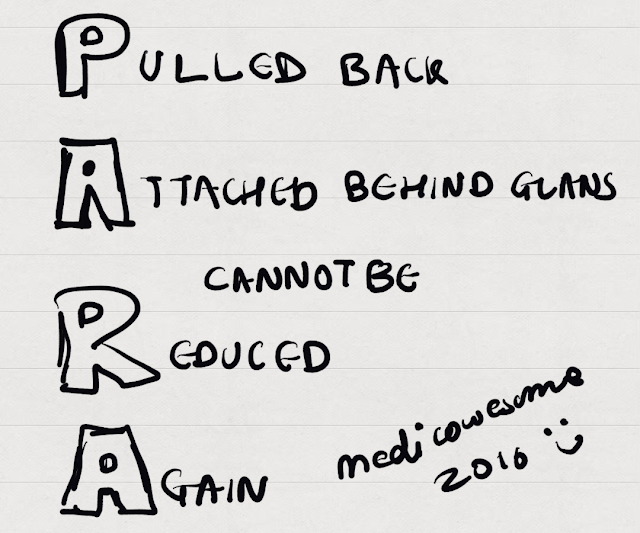 Why shouldn't you simply suture and close deep liver lacerations? Because of the risk of hemobilia and abscess formation. Polyarteritis nodosa is a necrotizing vaculitis of small and medium sized muscular arteries. 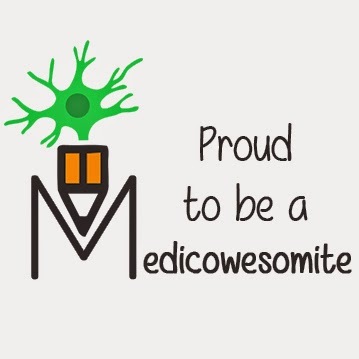 Do you know about microglia? OK think and tell..
Did you know there is something called as neurogenic claudication? Why do ferritin levels increase in Rheumatoid arthritis? It is an acute phase protein. The levels increase in serum as well as in synovial fluid. The rise is more in synovial fluid because of local production of ferritin in the inflamed joint. Ferritin levels show a positive correlation with ESR, CRP, platelet count, and DAS score. And a negative correlation with hematocrit levels. Is there a difference of levels in inactive and active disease? Yes, the levels are lower in inactive RA patients because of iron deficiency. Synovial ferritin production in active RA leads to increase of ferritin in active disease. Gold standards for diagnosis of iron deficiency in RA? What leads to high ferritin levels in SLE? The ferritin levels are correlated with ANA titre, anti-dsDNA titre, and SLEDAI score. Here's a short post about Sjogrens syndrome. Apparently, Qbanks don't write Scl-70 in their options. They like writing "Autoantibodies against topoisomearase I" and make my life difficult. Anyway, here's my attempt to remember this next time. I don't know if it'll work. But hey, no harm trying? Here's a mini post for the day! What are the symptoms of Polymyalgia rheumatica? What is it associated with? Never correct sodium too quickly. 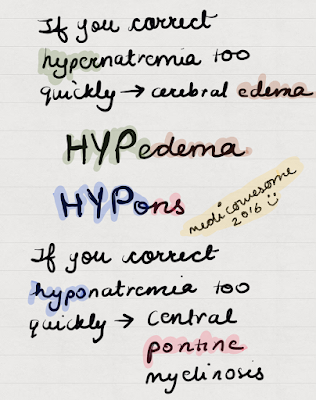 If you correct hypernatremia too fast, it'll result in cerebral edema. Why? When hypernatremia is corrected too rapidly, cerebral edema results because the relatively more hypertonic ICF accumulates water. 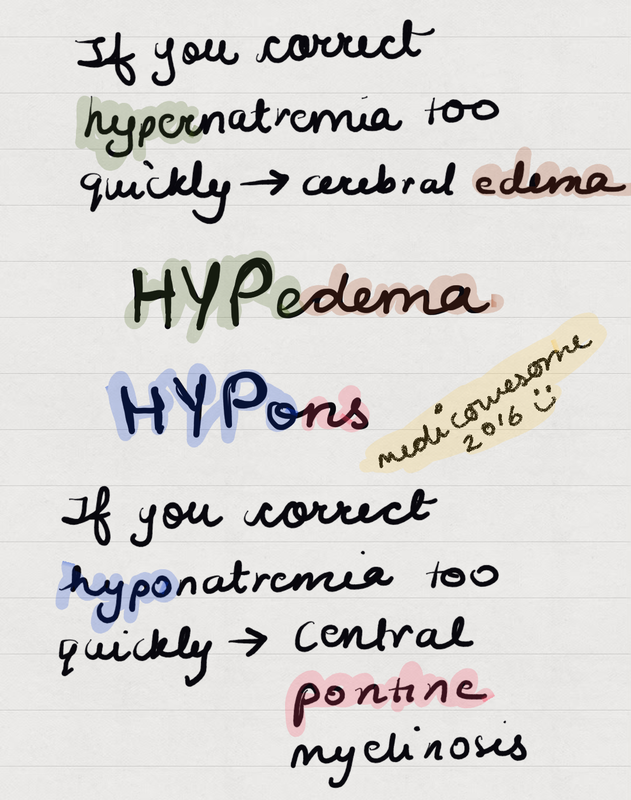 If you correct hyponatremia too fast, it'll result in central pontine myelinolysis (CPM) aka osmotic demyelination syndrome. Why? Chronic hyponatremia is associated with the loss of osmotically active organic osmolytes (such as myoinositol, glutamate, and glutamine) from astrocytes, which provide protection against brain cell swelling. However, organic osmolytes cannot be as quickly replaced when the brain volume begins to shrink in response to correction of the hyponatremia. As a result, brain volume can fall from a value that is initially somewhat above normal to one below normal with rapid correction of hyponatremia. The mechanism by which a rapid fall in brain volume results in demyelination has not been established. Does anyone know why left anterior descending artery is called widow's artery? In suspected metabolic alkalosis, always check urinary chloride levels. There will be a stimulus for Na and Cl reabsorption to replenish extracellular volume. Urinary Cl is very low ( < 25 meq/L). Administration of NaCl and water leads to correction of the metabolic alkalosis. Such causes of metabolic alkalosis are said to be saline responsive. Narrowing of the renal artery (Renal artery stenosis) causes renal bruit. So today I was reading about acyclovir and crystal induced acute kidney injury. Acyclovir is rapidly excreted in the urine (being both filtered and secreted) and has a relatively low solubility. Intravenous (IV) therapy may lead to the deposition of acyclovir crystals in the tubules if the patient is volume depleted. This results in intratubular obstruction and foci of interstitial inflammation. 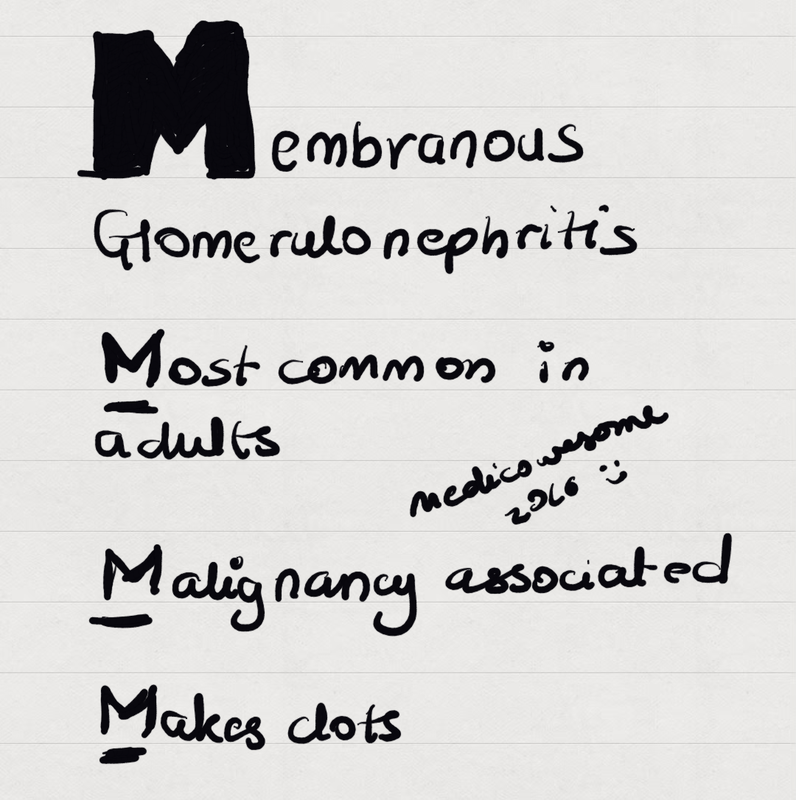 How to remember diseases associated with focal segmental glomerulosclerosis - Remember the letter H! Fact for the day: Hodgkins lymphoma is associated with minimal change disease.